It’s hard not to love Ty Dolla $ign because his mix of hip-hop and R&B sounds not only unique, but effortless. And Campaign is exactly what you would expect. Similar to his Beach House mixtapes, his raunchy lyrics, melodies and orchestral arrangements make it difficult not to vibe out and sing along. The project features Migos, Travis Scott, Trey Songz, as well as others and makes Campaign one of the best mixtapes of 2016. It’s clear the election season served as inspiration. The intro begins with a distorted voice saying, “I’m done with Trump and Hillary Clinton. Or is that one in the same?” as he goes on to advocate for equality and calls for people to head to the polls, insisting it’s necessary if we want change. 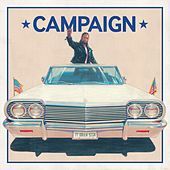 Last year, Ty Dolla $ign dropped Airplane Mode three months before releasing his debut album, Free TC. With so many guests and the excitement swirling around this audio campaign, it’s only right he releases another studio album and he’s hinted that his sophomore album, Beach House 3, is in the works and we can expect it in 2017.